It seems that all fresh installs of Microsoft Windows 7 fail to successfully update using the built-in Windows Update. Some manual intervention is needed. The issues are not always the same and this fix won’t work for all such issues, but I have had success with this on multiple Windows 7 installs – none of which would update properly after installing Windows. The very first thing you want to be sure of is that the date and time on your computer are accurate. You would actually get a different error than Windows just constantly searching for updates and never finding any, but it is the first thing the computer user should check if Windows Updates or any other software updates are not working or generating an error. Check that the date and time are accurate. 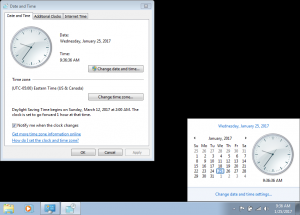 On Windows 7 you can adjust the date and time by clicking on the clock in the system tray and then click the link for “Change date and time settings…” Be sure your time zone is correct first and then adjust the date and time as needed. The real issue this article is intended to address is the fact that Microsoft Windows 7 fails to find updates after a fresh install. It seems not to matter at all if it is a retail install, an OEM install or a system reset. After the fresh install of Windows 7 the Windows Updates utility just remains at “Searching for updates” without ever finding any. Not even an error. It would stay that way for days if you let it. It is my hope that this resolves the issue for you as well. Brian Haines specializes in on-site computer repair, networking, installation, and training as well as Web sites and Web hosting. Serving Broward, Dade and Palm Beach Counties since 1999. Freeze your hard drive to recover data: Myth or reality? Budget Laboratory: Part 2 – iSCSI Virtual SAN with FreeNAS 8 | Fix the Exchange! Updated: Microsoft adds Universal Printing to Terminal Server!